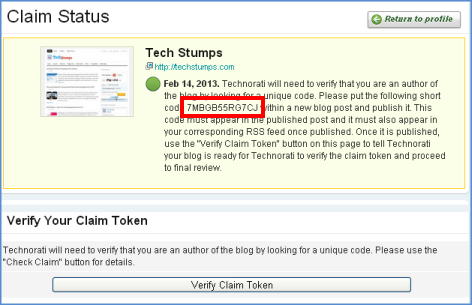 How to Submit your Blog to Technorati Directory? Technorati is a leading blog / internet search engine and web directory which indexes more than a million blogs. There is listed all major sites and ranked by traffic. You can check top stories, opinions, photos and videos of all types and most popular on the blogosphere. You can also submit your site to technorati to get some traffic. This is a free web directory service and you will get a backlink from Technorati. How to submit your Site to Technorati? 1. Go to Technorati website and sign up for new account. Login your account and you will see your Account Name on the top right panel. 2. Scroll down the page and search for “My Claimed Blogs” section. 3. Enter your site name in the text box and click on “Claim” button. 4. After that you have to give some information about your site such as Blog Title, Blog Description, Site URL, Site Feed address, Twitter profile, Facebook profile, Google plus profile, Site Category, Search Tags for your site. 5. Then click on “Proceed to next step” button. Return back to your account profile page and then click on “Check Claim” button where your newly added website in the claimed sites list. You will see one short verification code in a claim status section like "7MBGB55RG7CJ" and copy that code. 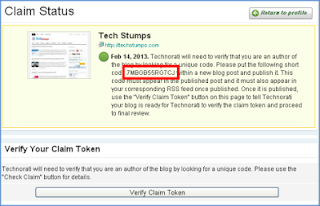 When writing a new post in your site, add this code within your post and click on “Verify Claim Token” button. That’s it. Generally your website will be approved and added to Technorati directory within a week. You will get a notification to your email when your website is approved by them. how to sign up to technorati.com ?